When we started on the roofing back in mid-July, we had no idea it would be this time consuming! Kyle figures there have been 80 hours of work put into installing the roofing alone. In deciding what to use, shingles were right out – too heavy and would likely fly off as we move the house. Kyle decided to use a standing seam metal roof, which we got from a local lumber yard. This is a concealed fastener roofing system, meaning that there are no screws showing, eliminating holes for water. Before we ordered, the lumberyard sent a rep out to measure the roof so we knew all the proper pieces we needed. Good thing too, because there are a lot of pieces! Once the roofing was delivered, Kyle and various people cut the panels to size by hand and fastened them to the decking. That was the easy part. After that, there was lots of little, unnoticeable trim pieces and water-proofing pieces that took a lot of time. My parents came one weekend in July and my dad helped Kyle cut and lay the panels. The dog-house dormers over the second loft proved to be troublesome again as we figured out how to ensure that water drained off it appropriately. Kyle and a buddy spent several hours figuring out how to tie in the two ridge caps that met at the peak. Since the 12 pitch roof line was taller than the 4 pitch, the smaller ridge slid under the taller one and both ridge caps were able to run all the way through. After a bit of trimming here and snipping there, they sealed the ridge caps with several layers of caulk. Hopefully that makes more sense in the pictures. So far, we haven’t had any leaks with the few light rains we’ve had since the roof has been completely sealed. All that we have left for the roof is cutting back some of the trim pieces and bending them over to look nice. The almost Final product where both ridge caps intersect. Looks a little raged, but with some bending and a lot of caulk, it gets the job done! Standing seam metal roof, in our experience, proved a bit trickier than we expected, but the only reason is that we have a tricky roof line. I asked Kyle if he would do it all the same if he could do it again. He said yes – though it’s been time consuming, the dormer lofts will be worth it for the space they will provide, and standing seam is a great roof to use in our situation. So there you have it. The project, and thus the blog, that has been 3 months in the making is finally done. Feels good to move on to another project! That’s the question Kyle and I have been wrestling with as we pare down our belongings in order to fit into 200 sq/ft. As we go through those boxes we have never unpacked each time we moved, we’ve found it easy to say we don’t need this and we’ve kept it all these years just because we had space for it. We’re coming to the end of these easy boxes, however. Now we’re to the possessions that we would rather not part with if we didn’t have to – like the clothes, shoes, and accessories I wear sometimes, the kitchen utensils that I usually don’t use, but do often enough to keep it around, the books we actually enjoyed reading and might read again, the box of decorations that haven’t been put up in this house, but might be put up in the tiny one, the condensed version of hobbies that I might just get into again. As we continue to design our space and look for appliances, we are hoping that 200 sq/ft will be enough. Let’s be real, it sounds a little daunting even to me sometimes. We hope a 10-cubic-foot fridge will be enough. We hope the kitchen counter space and storage spaces will be enough. When it comes down to making sacrifices to create more space, I may be asking myself if a hand crank washing machine instead of an electric one is enough…. But then, I pause and ask myself, enough to do what? To survive? To be happy, content, secure? To feel valued or to have worth? As a follower of Jesus, only Christ is enough. He is what brings me joy, contentment, security, value, worth. Not my stuff. Through this little conversation between me and God, he again invited me let go of the misplaced values I put on my possessions and allow Him to be enough for me. I don’t need the cutest clothes, or even the perfect body to feel complete and valued, because He is enough. I don’t need lots of stuff, hobbies, conveniences even, because He is enough. That doesn’t make downsizing any less easy. But I choose to find my value and worth in Jesus instead of my things or in what people think of me. He is my inheritance, my possession. Whether or not you desire to live tiny, God is asking you the same. “Am I enough for you?” What are you valuing more than Jesus? What is he asking you to let go of? Building a house is like a roller coaster. There’s lots of thrilling moments, twists and turns, as well as long hill-climbs. Since we got the trailer the first of May until about the end of June, there were lots of thrilling things going on and lots of visible progress. First a trailer appeared! Then, with one day and 5 strong helpers, BAM! the walls were up! Sheathing, roof framing, decking, and even a red roof made progress look impressive. Then in July, there came a hill-climb. Lots of work was being done, it was just not near as visible from the glances of the passer-by. Kyle has been plugging away on finishing the trim of the roof for about a month now. You can’t tell anything is happening, but when you look closely, you see the progress. Before long, viewers will have another thrill as we get the siding up. And then, I expect we’ll hear “You must be finished. When are you moving in?” Well, folks, there’s another LONG hill-climb ahead on the inside! The things we entertain ourselves with! Some tiny house builders have significant time they can totally dedicate to the project and knock out their home in just a few months. For us, however, life has not stopped. We both have full time jobs so house work happens on weekends (when we’re not busy) and evenings (when we’re not tired). Summer has proved to be busy, keeping us both, but more significantly Kyle, away from house work. We were excited to have Kyle’s sister and her boyfriend join us for a work day to re-jumpstart the progress mid-August. The project: shou-sugi-ban! This is an ancient Japanese technique of burning wood in order to make it more rot and bug resistant. Apparently, it’s starting to make its way, slowly but surely, back into modern building design. It took a few months for Kyle to convince me of the idea of BURNING our siding, but in the end, I absolutely love the look! The project included burning each board with a propane torch, brushing off excess char and sealing it with a stain/sealer. Derek headed up the burning, Amy and I partnered up in staining the wood, and Kyle worked on cutting the siding just perfect to fit around the wheel wells and other odd jobs. Here’s some pics of the process. It rained the day before, so we laid all the siding out to dry in the sun. Taking precise measurements around the wheel well. Cutting the siding to fit around the wheel well. Amy and I staining the siding. We loved the chance to catch up while we stained! Kyle hangs the first piece of treated siding! Since we had trouble finding good info on how to do this on the internet, we made a tutorial video that walks through the process of how we did it. You can view it here. Several of you have been asking to see the floor plan of our house. We designed it ourselves, based off of a conglomeration of several plans we have seen online. The measurements may look official, but they’re not. Tell us what you think. I’ve been busy with non-house things this month, so this blog is a conglomeration of progress since the last work-related post on June 15. Shou sugi ban siding: We finally got a propane torch and did some more experimenting with the shou sugi ban technique of burning wood to make it rot and bug resistant. I absolutely LOVE how it turned out! Kyle said that with the torch, it was actually pretty easy to make the even burn that you see below. Much better than over the campfire like our first try. More pictures and walk-through to come as we work on burning the rest of the siding. Roof ventilation: In order for the attic space to properly ventilate, Kyle and our friend Zac cut holes in the trim board that goes on the top of the outside wall and stapled screen over the hole so bugs and other unwanted creatures won’t get in. There will be a half inch of space between the roof and insulation in the ceiling in order to keep the roof cooler and help prevent condensation, acting like a soffit vent for a normal house. Visit from the Schmidts: Kyle’s parents came from Oklahoma to visit us over the 4th of July. In a few hours, Kyle and his dad had all the windows were installed except the big picture window in the front. We’re not sure all our appliances fit through the 2 ft door so we left the window out just in case. Kyle has learned so much of his craftsmanship from his dad through service projects, home projects and helping others. For years, his dad took his week of vacation to serve with Mennonite Disaster Service building houses or cleaning up after natural disasters, and Kyle had the opportunity to work alongside him on these trips growing up, and most recently has helped him with his remodel of his own home. What a great example of using one’s gifts to serve others. Thank you, Tim, for passing these values to your son. It’s been fun for me to watch him use his craftsmanship and creativity to build our home. I LOVE how the shou sugi ban turned out! We plan to use this technique for the cedar siding. Sometimes “date night” is a shopping trip to Menard’s. But I’ll take it! Kyle and his dad installing windows. The bathtub arrived and is in place! All the windows are installed. In my last blog, I shared the beginning of our journey into tiny living and how it all started with a deer. Through that little encounter, God opened my eyes to see some things I had placed above him and began to ready my heart for a big change. Read the full story here. Another step in the decision-making process toward tiny living came last December as Kyle and I were trying to compile a Christmas wish list for our family gatherings. After living in Thailand for 7 months, we acknowledged that we had more than most, and we couldn’t think of a single thing that we actually needed. We also started looking around our house at all the stuff that has been in boxes since we moved last and the things we have rarely or never used. We started dreaming about what it would be like to actually live in a tiny house, and I started getting excited about this idea and for the first time, began to consider it an actual possibility for us. We spent hours looking over tiny house floor plans, mapping out a few plans on our living room floor and trying to get a feel for what a 8×24 foot home would be like. We started thinking about all the money we would save in lower utilities and next-to-nothing rent, and how much more we could give to support our friends’ ministries around the world. We know a lot of people our age who are involved in missions, and desire to support God’s work through them. Also, because of our 7 month mission experience, we have Thai friends who have received eternal life through the ministries we were a part of and we want to see them continue. Around February, we were to the point where we both wanted to build a tiny house, but needed something to help us make that decision. So we went to a Tumbleweed Tiny House workshop in Denver where we learned lots of practical information, got some good ideas, and helped us make that final decision. Tumbleweed is a company that sells fully built tiny houses, trailers, and detailed, engineered tiny house floor plans. Tumbleweed was the first site Kyle looked at when he first discovered tiny houses. Tumbleweed conferences are designed so that even if you haven’t built a thing in your life, you would be given the resources to do so. And even for Kyle, who knows a lot about construction, the workshop gave us valuable resources and ideas that would’ve taken hours to research. And it definitely put my mind at ease about a few things (like composting toilets. 🙂 I’m sure there will be more on that topic in a future blog). 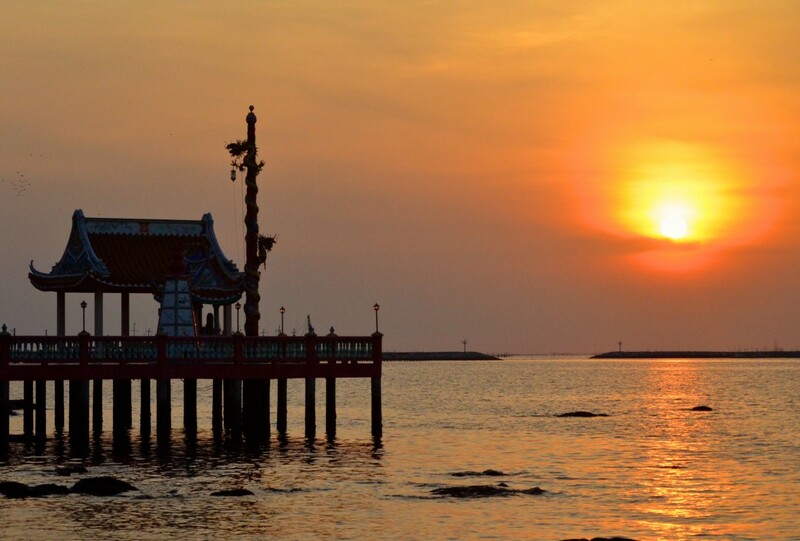 I thought I had surrendered everything to God while we were on mission in Thailand – I was wrong. Since we returned to the States just over a year ago, God has continued to reveal areas of our life that are not completely surrendered to him. Some of you may be thinking “I could never downsize to less than 200 square feet.” But let me tell you, it has been a joy to surrender our stuff and our lives to the God who pursues us and never lets us settle with anything less than his best. If He’s calling you to give up something, He will provide for you. It will be worth it. In fact, chances are, it will be the adventure of your lifetime! 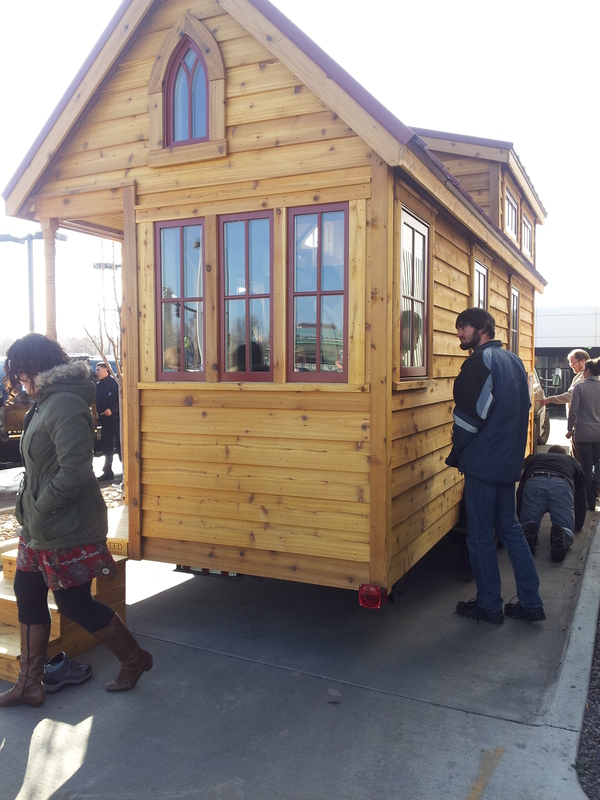 Our first tiny house tour at the Tumbleweed workshop in March! God keeps inviting us into wild adventures… I wonder where this one will lead!